Il Pigionale 4+1 is located in the centre of Pergine Valdarno, Italy and only 20 km (12 mi) from Arezzo in the tourist area "Arezzo And Surroundings". Holiday home Il Pigionale 4+1 is a nice stone building (80 sq m) that includes WiFi internet and air conditioning. The property can accommodate up to four guests comfortably in two bedrooms with two bathrooms. Near the property there are local shops where you can find fresh produce and other items. If you can't find what you need locally, there is a shopping center located 13 km (8 mi) from the property where you can purchase your food and personal items. Upon arrival you’ll find a nice clean well-maintained property perfect for a splendid holiday in Tuscany. A real benefit of renting a home, instead of multiple hotel rooms, is the ability to relax after a busy day of sightseeing with family and friends. Enjoy a meal together along with some local wine to finish the day. It's very convenient to have a washing machine on the property that is available for your laundry needs. Sharing a meal with friends and family is a big part of the Tuscan culture. Take advantage of the well-equipped kitchen to prepare meals using local produce while on your holiday. The kitchen includes coffee machine, microwave, toaster and refrigerator, as well as, plenty of tableware and cutlery for up to four people. 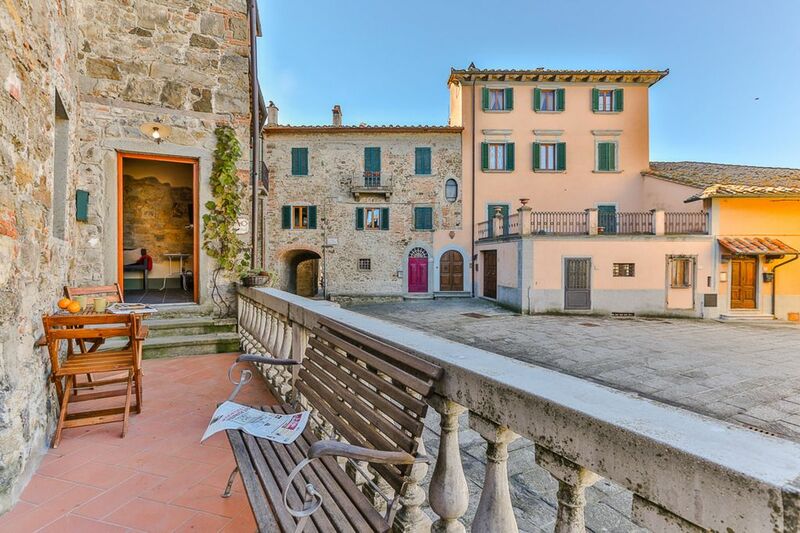 Most people enjoy visiting close-by cities and towns while on holiday, so for your reference this is a list of popular places with driving distances from the property: Arezzo 20 km (12 mi), Cortona 44 km (27 mi), Siena 50 km (31 mi), Greve In Chianti 58 km (36 mi) and Montepulciano 62 km (38 mi). The highway is only 8 km (5 mi) from the villa and there is a train station 3 km (2 mi) away. Some other major tourist destinations you should consider visiting are: Florence 64 km (40 mi), Viareggio 161 km (100 mi), Forte Dei Marmi 168 km (105 mi), Rome 229 km (142 mi), Venice 318 km (197 mi) and Milan 360 km (224 mi). Pets Welcome - If your pet is travelling with you on holiday that is not a problem at Il Pigionale 4+1. If you have a large dog or multiple pets, please ask for permission prior to booking. Nearest Airports: Firenze Peretola (Flr) 82 km (51 mi), Pisa (Psa) 142 km (88 mi), Bologna (Blq) 162 km (101 mi), Roma Ciampino (Cia) 244 km (151 mi) and Roma Fiumicino (Fco) 256 km (159 mi). Cooking Lesson (on request): Experience a home-cooked authentic Tuscan dinner. Coming to Tuscany? Enjoy to cook and eat a real Tuscan meal with your local hosting friends. The cost and the date have to be arranged in advance with the owner. Over the years our guests have commented that the best part of their trip was the time spent with the family cooking and learning about traditional Tuscany cuisine. Please contact us if you need further information.Cooking Lessons - If you're interested in learning more about Tuscan cooking, inquire about the cooking lessons that can be arranged at the property. It's a fun way to spend time with friends and family while discovering the techniques needed to master Tuscan cuisine. For more details and the supplemental cost, please contact us. Professional Chef - Are you looking for a real treat during your holiday? Why not book a professional chef to prepare and serve you a mouth-watering meal using local produce? The chef will arrange the meal based on your preferences and dietary requirements. The chef will offer suggestions for the various courses and the wine. Ask for more details and the additional costs. Tours - Custom tours can be arranged by the owner for your group. For more details about the tours offered, speak to the owner upon arrival or inquire prior to booking. The cost will vary depending in the specific tour and number of people. Including: kitchen, bedroom + ensuite bathroom. Kitchen: dining table (people: 5). Bedroom + Ensuite Bathroom: double bed, WIFI internet, mosquito net, ceiling fan, basin, toilet, shower. Including: living room, bedroom, bathroom. Bedroom: two single beds, WIFI internet, air conditioning, mosquito net. This little house had everything we needed. The village is just what my husband and I were looking for - quaint, quiet, friendly, and close to many larger towns for day trips. However, the best part of this rental was the unexpected awesomeness of Irene and Edoardo - the owners and hosts. The two of them made our experience unforgettable, personable, and unique. They were always on the ready for advice or suggestions, and even were available to be tour guides. They became more like friends than tour guides! We will definitely go back and stay at one of Irene and Edoardo’s places! Our stay at Il Pigionale was one of the highlights of our trip. You really experience the local ‘italian’ feeling. The nature in the area is very beautiful, the accomodation looks juist as in the pictures and is very clean and cosy and the host is very helpful and kind. We recommend staying at Il Pigionale and we will definitely come back! An amazing experience. For all we did in Italy, the time in Pergine Valdarno and our wonderful time with our host are by far our favourite memories. A great villa, a great host, and a fantastic village lifestyle that one can simply blend into. A beautiful experience! 2-floors, stylish furnished and equipped with all necessary things. Beutiful garden with swimming-pool (did not use it, as we stayed in Nov). All rooms with bathrooms - it is very comfortable. Irene is a perfect host! She took care of us and show around a village. Her tips and hints were very useful. Would love to come back on summer with friends. We had a fabulous stay in this friendly village. The apartment was really lovely. Everyone should stay here! The dinner was the high-light of the visit. Irene was very helpful. It was nice to stay in a small family run apartment, as it had all the personal touches.